Art Lab Gnesta has collaborated with schools right from the start in 2011. Through participation in workshops we give young people the opportunity to be part of creating something permanent, at the same time as they gain knowledge of the democratic processes on which our society is based. We work with young people in several projects towards a common understanding of the methods of contemporary art and how democracy functions. We create a packaged concept based on the needs of a particular school. This can be anything from a half-day creative boost to a course that lasts for a complete semester. If you are unfamiliar with the “Creative School” concept or if insufficient resources are available, we can help to write and submit an application to the Swedish Arts Council. 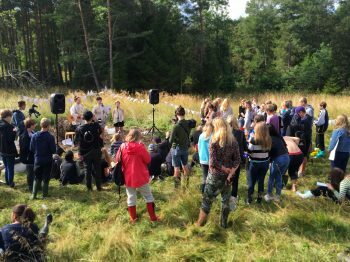 The participants in Swamp Camp spent a full day in the swamp with 100 eighth graders from Frejaskolan in Gnesta, artists and scientists.